Stephenson has been blogging for The Daily about W. Eugene Smith, the subject of his forthcoming biography. Here, he writes to managing editor Nicole Rudick from the island of Guam. I am writing you from my hotel in Guam rather than taking a day trip to Iwo Jima. The visit was canceled by the American and Japanese embassies, because of the earthquake and nuclear disaster in Japan. The Japanese government opens the uninhabited island to civilians only one day a year, and I’ve been planning my month-long Pacific journey in Smith’s footsteps around this year’s date, March 16, for the past ten months. I’m disappointed, but I understand the decision. A government-sanctioned sightseeing trip to a remote island seems inappropriate while Japan is undergoing the current tragedy, no matter that 140 Americans had gathered here for the trip, with a mirror group in Tokyo. It means I’ll have to come back next year. Smith made stunning photographs of the Iwo Jima battle, and I can’t finish this biography without seeing that tiny piece of volcanic rock poking up out of the ocean. It measures only four and half miles long and two and a half miles wide, yet we (Americans) had eight hundred ships and two hundred thousand troops off its shores in 1945. The absurdity of that reality must have impacted young Smith, who was from landlocked Kansas: We’re fighting the war of all wars over this? W. Eugene Smith, Saipan, summer 1944. Courtesy of the Heirs of W. Eugene Smith and the W. Eugene Smith Archive at the Center for Creative Photography at the University of Arizona. I flew out of Tokyo two days before the earthquake and spent a few days in Saipan, which is part of the Northern Mariana Islands along with Guam, Tinian, and Rota. It was eerie to leave Japan after eighteen enriching days and to barely escape the disaster and fallout. My nineteen-year-old interpreter, Momoko Gill, who grew up mostly in Japan but whose parents are currently abroad, was stranded there for nine days before getting a flight to Bali. I felt partly responsible for her being there alone, and it wasn’t a good feeling. The damage to Japan’s nuclear plants conjured images of World War II’s atomic bomb destruction, and, for me, it stirred impressions from my trip to pollution-ravaged Minamata two weeks ago. Intertwined were thoughts about the new friends I made by following Smith out here. It was a jumble of emotions, which may mean that my work in Japan and the region continues after I’m done with Smith. In Saipan, my hotel evacuated everybody to the upper floors, where we sweated out the tsunami. The hotel, which sits on one of the American-invasion beaches, was full of Japanese, Korean, and Russian tourists. The Russians wore life preservers during the ninety-minute scare, and nobody knew where they’d gotten them. We were relieved when the water only rose three feet. It may have been the Saipan invasion of 1944 when the twenty-five-year-old Smith became an artist. Saipan is a beautiful, lush patch of rock and thick vegetation, only twelve by five miles, with a deep history of indigenous people, the Chamorro, who lost control of their lives forever when the Spanish colonized the place in the early sixteenth century. Japan took it over in 1918, and the United States invaded and wrested control during WWII. Smith took some of his first combat photographs during that battle. 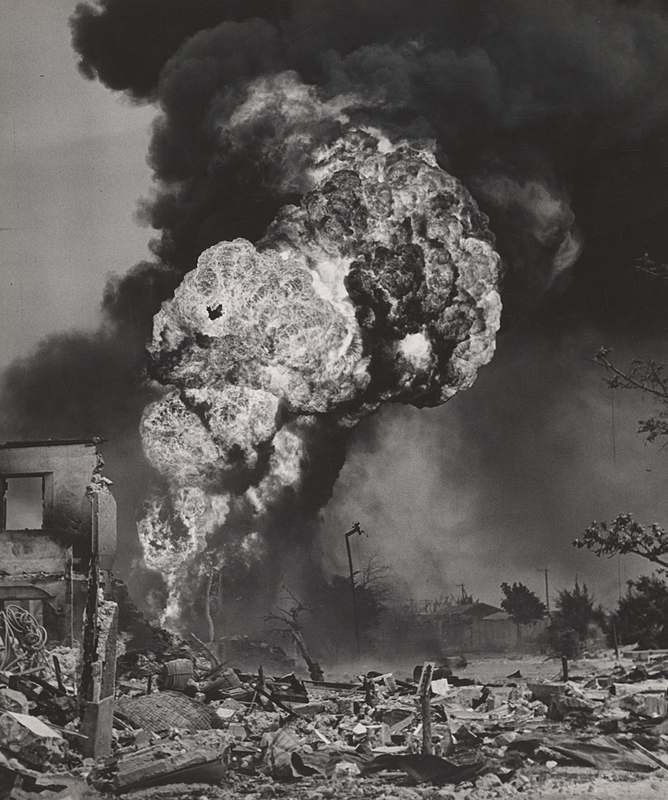 The paradoxes of war, beauty in destruction, and the fate of hapless individuals against the onslaught of collective forces are themes that Smith investigated for the rest of his career, and his trademark printing techniques—producing tensions between dark and light shades that John Berger once said were essentially “religious” for Smith (more truth in darkness)—may have been born on those battlefields, too. 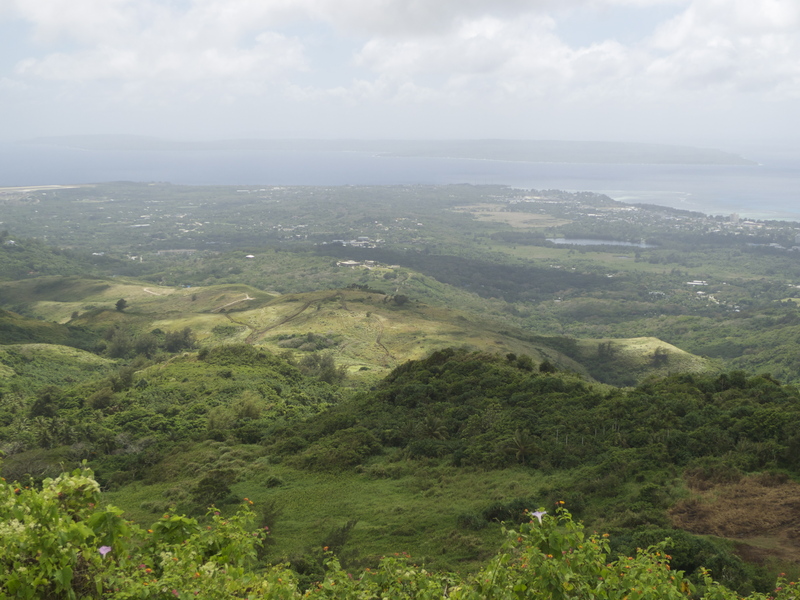 A view of Saipan from Mt. Tapochau, with Tinian in the background. Photograph by Sam Stephenson. I want to tell you about a man I met in Saipan who helped me track Smith’s path through the island. He’s sixty-three-year-old historian Don Farrell, and before I left home I was told he’s the best battlefield tour guide in the Pacific. He grew up in the American West, in various places like Spokane, Washington, and Billings, Montana. He was sent to military reform school for making explosives. He was kicked out for making corn liquor. Farrell roamed around and eventually worked his way through Cal-State Fullerton with a degree in biology in 1974. He moved out to the Northern Marianas in 1977 to teach math and science and later worked for the local government in Guam. His wife of thirty years is a native Chamorran, and they live on Tinian. This place is his home; he’s not a visiting scholar. He wrote the local history textbooks they use in schools here, and he became tearful telling me a story about a Chamorran family that was elated to find the only known photograph of their grandfather in one of his textbooks. It was the first time the family had ever seen that picture. Not many university academics can tell a story like that. Have you seen Terrence Malick’s Pacific-war movie The Thin Red Line? I’ve probably watched it seventy-five, maybe a hundred times. Sometimes when I’m working in my home office, I’ll play it on the TV in the background, like it’s classical music or opera. The rhythms of its audiovisuals are sublime. Some critics are annoyed by Malick’s use of voiceover, though. I know what they mean: While Malick’s camera pans an intricate jungle root system with sunlight cascading through foliage, a character’s voice softly murmurs such things as “What’s this war in the heart of nature?” “Why does nature vie with itself?” “Who are you to live in all these many forms?” It can be tedious. But I’ve got to say, after spending some time with Farrell walking through the lush jungles of Saipan, Tinian, and Guam, pondering the unimaginable carnage that took place on these tiny dots of land populated by uninvolved natives, abstract thoughts and unpredictable images begin floating through your brain. Even today, the insanity of war is accessible here. The European theater is more definable, with home territories and borders; the Pacific is hazy and hallucinatory. I wasn’t sure what I’d find on these islands to help me tell Smith’s story. But I think what I discovered may reveal more about him than do the oral-history interviews from the previous two weeks in Japan. Before I left home, my friend, the writer Allan Gurganus, handed me Junichiro Tanazaki’s Seven Japanese Tales, which I read on the fourteen-hour flight from Newark to Tokyo. In a story called “A Portrait of Shunkin,” a bitter student attacks his beautiful, blind, and masochistic music teacher, leaving scars on her face. Her lover, also her apprentice, pokes his eyes with needles to blind himself so he can’t see her blemishes. It is the ultimate absolutist Japanese aesthetic gesture. Photographer David Vestal, Smith’s friend, once told me that Smith’s problem was that what he saw wasn’t there, so the camera had no way of recording it. That’s why he had to work so hard in the darkroom, and all of Smith’s master prints made after the war have an absolute white color and an absolute black somewhere in the picture, frequently in several places. This is the graphic war John Berger saw playing out in his photographs. Perhaps this conflict took root in Smith during combat in the Pacific. Or maybe it was in his blood: he always said he felt like he was from Japan in a former life.